While the balance of opinion toward abortion nationwide has remained largely steady over the past 20 years, there are widening disparities in public attitudes on the issue across different regions of the country. The biggest gap in support for legal abortion – and one that has widened over the years — is between the South Central and Northeast regions of the U.S. In 1995 and 1996, 70% of New England residents generally supported legal access to abortion compared with 52% in the South Central region – an 18-point gap, according to Washington Post/ABC News surveys. This difference has nearly doubled to 35 points in Pew Research Center surveys during 2012-2013. 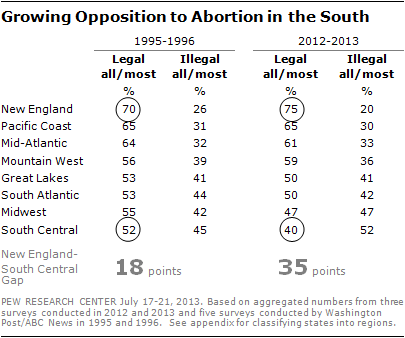 Support for legal abortion remained widespread in New England (75%), but fell to just 40% in the South Central states.